Last week marked a wild ride on Wall Street and in foreign affairs. On Wall Street, the week started up, then went down, then went all over the place. The Dow sank to a low of 16,349 late on Thursday before bouncing back to close Friday at 16,550, leaving it slightly up for the week. Gold did its usual reverse of those functions, mostly. It shot up to a high of $1,309 after being in what we consider “on sale” territory for a few weeks, below $1,300. Gold is still a great deal at $1,309, but what to make of a market where both gold and the Dow end the week on a relative high note? For that answer, we might look to foreign affairs and things going on in the world. On Thursday President Obama announced that he had authorized more air strikes in Iraq for “humanitarian reasons.” Regardless of how you might feel about “humanitarian wars” the market seems in favor of this one. War means more defense spending for military contractors like Lockheed Martin and KBR. The perception could also be that something will be done to stabilize the oil markets in Iraq, which are mired in disputes over ownership and profit-sharing – surprise, surprise. There is also a persistent belief that war is good for the economy. People will recite the claim that WWII got us out of the depression, as if it’s biblical truth. It’s part of the broken window fallacy that people, especially followers of the economist John Maynard Keynes, like to believe. Destruction necessitates rebuilding. Rebuilding means spending. Spending means jobs. Therefore, destruction means growth. Got it? People, respected economists, really believe that. Everybody is getting frustrated with the stagnant economy. People who don’t understand why it is stagnant might just think another war is required. Enough people think a new war in Iraq will be good for the economy that it explains the market bouncing for it, or at least in spite of it. At the same time, the situation in the Ukraine is de-escalating on the Russian side. That is also good news. War in Iraq is one thing. There’s oil, they are no real threat to us, and if spending is what we need to do, there is limitless opportunity in Iraq for that. However, tangling with Russia is a pretty different scenario. They actually do have a military, one that Putin has shown he is not afraid to use. They have nuclear weapons. The United States does not, historically, mess with other nuclear powers. They are an integral part of the emerging BRICS economic power bloc. It’s tremendously lucky that they seem to be backing down – at least for now, at least this time. Gold knows better. That is why gold is also up. Gold knows that instability and violence are always bad news. A(nother) war in Iraq is not likely to turn out any better than the previous two. A de-escalation from Russia is only one battle in that situation, in terms of currency and control. It is not the whole war. 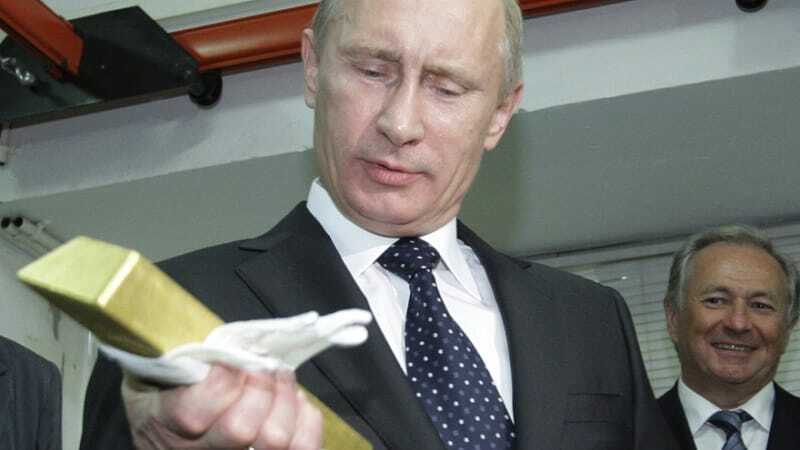 Gold is aware that Russia may just choose a more opportune time to engage further. Watch out.